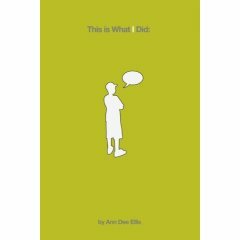 Perhaps better titled as "this is what I didn't do," this is a story about a boy named Logan who is incapable of doing anything. A modern day Oblomov, Logan spends a lot of time telling us what he would like to do but very little time doing any of it. He once witnessed a horrible crime that involved his best friend and that event has haunted him and prevented him from defending himself in the future. As a result, he is bullied by other boys and their friends. Only a similarly outcast girl who loves palindromes will take to him. The book is clever enough, I suppose, and you may enjoy it, but I found Logan completely maddening and useless. Watching him get beat up for 150-odd pages is not my idea of a good time (or a good read). Without real character growth, I just found myself terribly frustrated and tired by this book.